When you are buying property, you are buying land. Where that land is is very important, but how much land you buy is important as well. You can get all sorts of lots in all types of configurations, but the most common lot shape is a rectangular one. One dimension is the depth of the lot, but another is the width – the width at the front is also known as frontage. I have gone into a little detail about frontage versus depth in the past, but I wanted to elaborate further. A great deal of Edmonton real estate was developed when land was plentiful. Well, let’s be honest, land is still plentiful in most of Canada., but you can’t get new a property with a good amount of frontage these days. And why is that? Well money of course! A caveat: When I talk about frontage, I am talking about standard, rectangular lots. I am not talking about super-wide million-dollar river valley view lots. There are definitely diminishing returns to lot widths. Frontage is costly. It requires money to pave roads in front of homes or businesses. Sidewalks need to be poured, drainage needs to be considered. Perhaps grass and trees will be planted. The narrower a developer can make a lot, the less expensive it is for them to well… develop. Basically, the per-parcel price is less if the frontage is less. And maintenance issues for the City of Edmonton is less as well. Think about the street sweeping and the sewer lines and even the power lines. If a developer can squeeze more houses on a strip of land, they’re going to do it and the City of Edmonton is going to allow them. So there’s a cost associated with frontage. But just because something is expensive doesn’t necessarily mean it’s desirable. What makes frontage so valuable to the home owner when it comes to real estate in Edmonton? A standard residential lot in Edmonton back in the day (think 1950s) was a whole 50 feet wide. Compared to lots being developed today, that’s enormous. You can actually fit two so-called skinny houses on a lot like that now – so that right there means that frontage is valuable. If you could tear down your house and build two, you’re likely to be able to make some money on your investment. If you buy a house with a large amount of frontage (50 feet or more), you might be able to put two houses on the lot in the future. Even if you don’t want to do this, someone else might – that means your lot has more potential than a narrower one. More potential means more value. I can’t stress this enough. Edmonton is a driving city. You cannot easily get around on public transit alone. It might work for most of your week, but chances are you’ll be at a disadvantage without a vehicle. And those vehicles need to be parked somewhere. Also your guests need to park somewhere. When is the last time everyone arrived for Thanksgiving dinner on the bus? Didn’t happen? So we need places to park. Areas with low frontage typically don’t have much street parking. There may be a driveway, but often there are no spots to put extra cars on the street. If you have more than a few people over, and you’re using the driveway because your garage is full of stuff (and you know it is), then you just ran out of parking! You should have bought a property with some frontage! There is only so far you can go upwards or backwards on a lot. 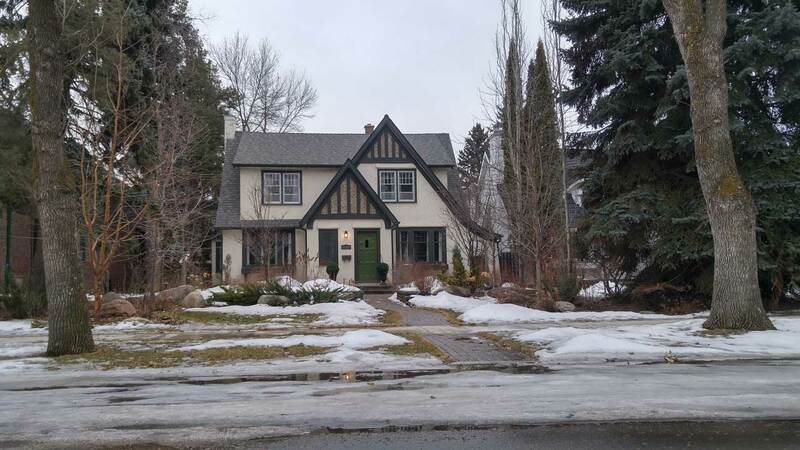 Now, I’ll be the first to say that a great deal of Edmonton real estate is not typically lacking for square footage – there are plenty of large homes in town. However, you are still limited in what you can do with a narrow lot. A wide lot means potential for a wide house. And wide houses are still more desirable than narrow ones. There is just more flexibility in how you can lay out a home if you have more frontage. More frontage means more space is possible between houses. This is great if you want to build a storage shed, or just have some space to walk between your house and the neighbour’s. It can be a small thing, but it’s appreciated nonetheless. I know I really appreciate having somewhere to store the firewood and the ladder and my extra snow shovels. There’s no question that being farther away from an adjacent building is better for fire safety. And with homes being made out of more flammable materials, it makes a difference if you have some space between you and that neighbour with the massive barbecue. By the same logic, if you have some width between structures rainwater that happens to collect between homes has a chance to go somewhere besides your basement. All of this with the caveat that you don’t have a house so large that it takes over the whole width, of course. Typically sunlight is limited when frontage is reduced. You can’t have a large house on a narrow lot without building a second storey. If you put taller, narrower houses together more tightly, there is less sunlight for main levels and less sunlight for the spaces between the houses. There may even be less for the back or front yard depending on the exposure of the home. This can be important because sunlight is in short supply for much of the year. Edmonton has more sunlight than most places this far north, but come winter, you’re probably going to want all the sunlight you can get. Choose a lot with more frontage if you value sunlight. Remember when I said that frontage was costly for developers? Well frontage can be costly for home owners as well. There are maintenance issues associated with frontage. There is more snow removal to think of more grass cutting as well. Remember I mentioned that the city has more sewer line to maintain and street sweeping to do as well? Well, you’re going to have to pay for it in your taxes. Taxes are calculated based on the value of your property and that value is partly calculated with frontage in mind. Be aware that this extra real estate perk does not come for free. Regardless of the costs, I think the benefits outweigh the drawbacks. Do consider frontage when shopping for a home. It’s not possible to get a wider lot everywhere in Edmonton – real estate here varies by area just like all cities – but when you’re looking where wider frontage is possible, I would think about the benefits and whether you would value them over the drawbacks. Other things can be changed; the home can be renovated, landscaping can be upgraded, but frontage is forever. I say: Go big and go home.